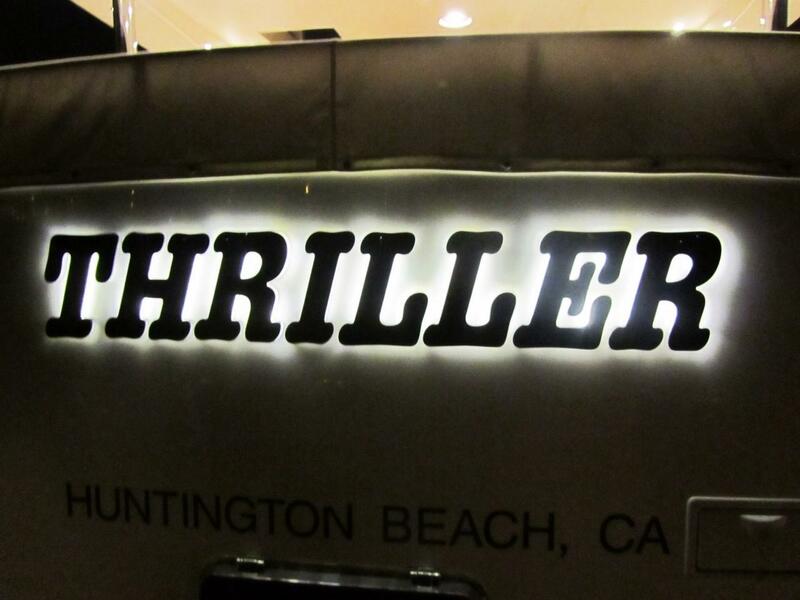 "THRILLER" is a 70 Johnson Sky Lounge Motor Yacht. She is powered by 1400hp Caterpillar 3412E diesels with electronic controls and only 350 hours, offering a 24 knot cruise. Side Power bow thruster makes docking easy and ABT-TRAC digital stabilizers provide comfort underway. Northern Lights 20KW and 9KW plus Freedom inverter provide AC power when away from the dock. There is air conditioning and heat in the sky lounge and in four luxurious staterooms, each with adjoining head. Marine electronics include two Furuno Nav Net multi-function radar, GPS, chart plotters, Simrad autopilot, Raymarine Tri-data, Icom VHF radio and more. Video cameras throughout. Exceptionally well maintained and used only lightly by a knowledgeable yachtsman. LLC owned. "Thriller" is a Skylounge Motor Yacht with four staterooms and a crew area forward which is accessed from the foredeck. The interior cabinetry is varnished cherry with burlwood accents and carpeting throughout. Hanging lockers are cedar lined. All soft goods are upgraded with designer fabrics. One enters from the sundeck through a stainless framed glass sliding door which is air actuated. Two steps down to the salon. The spacious salon has fixed windows port and starboard. To starboard is a large U-shaped leather sofa with a glass coffee table and two stools. To port is a wine chiller, a swivel chair with cabinets outboard. There is a pop-up Fujitsu Plasma 42" TV to port with the entertainment center and electrical panel forward in the salon. Aft to port is a spiral stairway leading down to the master stateroom. From the salon up two steps to the U-shaped galley to starboard and dinette opposite to port. The dinette has U-shaped seating, a burlwood inlaid teak fold out table with a locker below. There are stainless framed wrap around windows forward of galley and dinette. The sole is teak. Down six steps to three guest staterooms. Forward is the VIP stateroom with a walkaround queen size berth on center, shelves and cabinets port and starboard, hanging locker to starboard, followed by the guest head through a curved door. 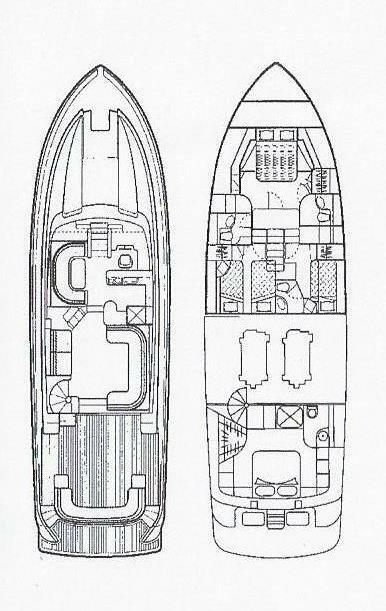 There is an overhead hatch on center, opening ports port and starboard, a full length mirror on the main bulkhead, and a built in Apex TV. The VIP guest head has a mirrored headliner, stall shower with a hand-held adjustable shower head, a Magnum Opus Vacu-flush marine toilet, opening port behind a mirrored cabinet, sink set into granite counter with designer faucet, and mirrored cabinets. The starboard guest stateroom has over under berths, hanging locker, Splendide 2000 combi washer dryer in a built in locker, opening ports, and an adjacent guest head. The head has a hand held shower with shower curtain, sink set into granite counter, a Magnum Opus Vacu-flush toilet, mirrored cabinet and headliner. The port guest stateroom has side by side berths, mirrored bulkhead, two opening ports, hanging locker and a built in Apex TV. Forward and up a step to another guest head. Head has a stall shower, sink set into granite counter, a Magnum Opus vacu-flush toilet, and opening port behind mirrored locker. From the salon and down a spiral aft stairway to port leads to the full beam master stateroom. There is a king size berth on center with shelves and lockers P&S, vanity, full length mirror on bulkhead, four opening ports, and a Visio TV. The master head has a stall shower with Lexan door and adjustable hand held shower head, sink set into granite counter, Magnum Opus Vacu-flush toilet, and opening port behind mirrored cabinet. The skylounge is accessed up teak steps from the sundeck through a glass and stainless door. The helm is to port with helm and navigator Pompanette seats, complete engine controls and gauges, and a stainless wheel. There is an L- shaped guest seating with teak inlaid burlwood table. U-Line 4 cu. ft. refrigerator/ icemaker to starboard, an opening hatch on center and outdoor carpeting throughout. Aft from the skylounge is another glass and stainless door leading to the bridge deck. There is a Quicklift 1600 lb. wireless power rotating davit (2016) with a Caribe 11' hard bottom tender with a 40hp Honda outboard, a large storage box, and an optional Seadoo waverunner. IPAD Controls for entertainment, cameras, etc. "THRILLER" is a 70 Johnson Sky Lounge Motor Yacht. She is powered by 1400hp Caterpillar 3412E diesels with electronic controls and only 350 hours, offering a 24 knot cruise. Side Power bow thruster makes docking easy and ABT-TRAC digital stabilizers provide comfort underway. Northern Lights 20KW and 9KW plus Freedom inverter provide AC power when away from the dock. There is air conditioning and heat in the sky lounge and in four luxurious staterooms, each with adjoining head. Marine electronics include two Furuno Nav Net multi-function radar, GPS, chart plotters, Simrad autopilot, Raymarine Tri-data, Icom VHF radio and more. Video cameras throughout. Exceptionally well maintained and used only lightly by a knowledgeable yachtsman. LLC owned. Sea-Doo Wave Runner (optional); all personal gear; loose items; galley gear; CD's; charts; fishing equipment; tools; spare parts; supplies & items not specifically listed on equipment list specifications sheet. *Required. *Required. 1 + 5 = Wrong verification number!